My friend Harry Thomason is raising money for a new version of his movie. I did a thing with Harry at last year’s Hot Springs Documentary Film Festival. To support the project, go here. That is all. The text of the site is below. A compelling story of how right wing zealots have tried to destroy the Clintons for decades. More than ten years ago a documentary entitled “The Hunting Of The President” was released to almost universally positive reviews. But not many people saw it. Why? Because politicians in control of Washington D.C. pressured major theater chains not to show the film. They were very effective. Why didn’t they want you to see it? Because the film clearly shows that both President Bill Clinton and his wife were (and still are) the objects of a smear campaign by right wing extremists. (The film draws a clear distinction, by the way, between these radicals and true, mainstream Republicans). And why were these powerful, secretive operatives so anxious to undermine the President? Because they had controlled Washington for decades and were determined to continue doing so. They perceived Bill and Hillary Clinton as a threat to their entrenched interests. The best way to counter that threat was to destroy the Clintons forever — no matter what the cost to our nation. The 2004 version of the “The Hunting Of The President” (based on the book of the same name) examined how this right-wing cabal carried out their plans, the role of the press in feeding the media’s ravenous hunger for scandal, and the damage that was done to many innocent people as a result. It’s no wonder that some of those who played a role in those events made such an effort to keep the film under wraps. But the way we watch movies has changed dramatically in the 10 years since the film was first released – theaters and traditional television networks are no longer the only options available. Also, during that same decade, a number of new facts surrounding the material covered in “The Hunting Of The President” have come to light. Perhaps most significantly, several of the major players who were involved in the conspiracy to bring down Bill and Hillary Clinton have since had a change of heart and come forward to say that what they did and what they thought about the Clintons was wrong. Our hope is to take advantage of these changed circumstances. We are in the process of revising the film — now called “The Hunting Of The President Redux” . This updated version will include new interviews, new information, and new perspectives from those who participated in the 2004 original. We want to make sure as many people as possible have a chance to see the film, recognize this attempted hijacking of our political and judicial process for what it was, and understand how it continues even today. During this election year, we feel it’s more important than ever to make audiences aware of how well-intentioned people across the entire spectrum of opinion are in danger of having their voices drowned out by a miniscule minority of (mostly extremely wealthy) zealots interested only in protecting their narrow self-interests. We need to raise all the money we can, but if we could raise $100,000 to film more interviews, finish post production and promote the film, it could help influence the general election in these troubled times. Any candidate who runs as a moderate (Republican or Democrat) will be facing the same vicious attacks both Clintons have for decades. True, this is sort of like fighting a nuclear war armed with a BB gun when compared to the money that will be spent on the elections by billionaires intent on shaping this county to benefit only themselves. But if there are enough BB guns, we can win. Here is what you will get: the satisfaction of being part of a group that is doing what it can to prevent people filled with bizarre ideas of what America is supposed to be — led by people willing to tell any lie to get votes — from gaining the upper hand. Democracy is always unsafe under those conditions. You’ll get the satisfaction of knowing you did your part to help restore America’s heart. A heart that cares for others, knows where it came from and where it should go. At the moment we’re in danger of being held hostage by a radical minority and it is time to change that fact. $5.00 This is an important mission and you will have our Eternal Gratitude! 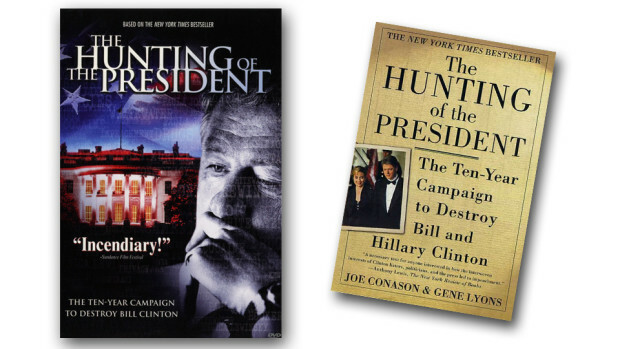 Plus a download of the latest version of the original The Hunting of the President book by Joe Conason and Gene Lyons and a free subscription to The National Memo daily newsletter edited by Joe Conason and featuring columnist Gene Lyons. $25.00 A beautiful, color 14”x17” limited edition Lobby Card autographed by the Director, a Producer and a Writer. In no category will these cards be sold to the public! You will also get a download of the latest version of the original bestselling book, The Hunting of the President by Joe Conason and Gene Lyons and a free subscription to The National Memo daily newsletter edited by Joe Conason and featuring columnist Gene Lyons. $50.00 Stream the film, The Hunting of the President Redux for a weekend (date will be announced later) plus the aforementioned 14”x17” limited edition Lobby Card. You will also get a download of the latest version of the original bestselling book, The Hunting of the President by Joe Conason and Gene Lyons and a free subscription to The National Memo daily newsletter edited by Joe Conason and featuring columnist Gene Lyons. $100.00 A DVD of The Hunting of the President Redux plus the aforementionedlimited edition signed Lobby Card. You will also get a download of the latest version of the original best selling book, The Hunting of the President by Joe Conason and Gene Lyons and a free subscription to The National Memo daily newsletter edited by Joe Conason and featuring columnist Gene Lyons. $500.00 Listed as a Freedom Fighter at the end of film plus a DVD of The Hunting of the President Redux and the aforementioned limited edition Lobby Card. You will also get a download of the latest update of the original bestselling book, The Hunting of the President by Joe Conason and Gene Lyons and a free subscription to The National Memo daily newsletter edited by Joe Conason and featuring columnist Gene Lyons. 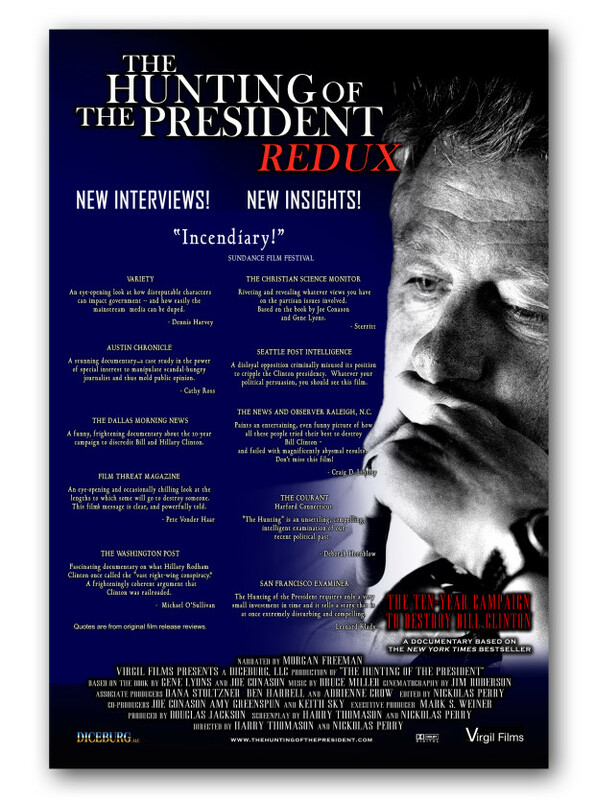 $1,250.00 Listed in the end credits as Associate Producer plus a DVD of The Hunting of the President Redux and the aforementioned limited edition Lobby Card. You will also get a download of the latest version of the original bestselling book, The Hunting of the President by Joe Conason and Gene Lyons and a free subscription to The National Memo daily newsletter edited by Joe Conason and featuring columnist Gene Lyons. $2,500.00 Listed as Co-Producer in end credits plus a DVD of The Hunting of the President Redux and the aforementioned limited edition signed Lobby Card. You will also get a download of the latest version of the original bestselling book, The Hunting of the President by Joe Conason and Gene Lyons and a free subscription to The National Memo daily newsletter edited by Joe Conason and featuring columnist Gene Lyons. $5,000.00 Listed as Co-Executive Producer in the end credits plus a DVD of The Hunting of the President Redux and the signed limited edition Lobby Card. You will also get a download of the latest version of the original bestselling book, The Hunting of the President by Joe Conason and Gene Lyons and a free subscription to The National Memo daily newsletter edited by Joe Conason and featuring columnist Gene Lyons. Plus, if you wish, the director will call you and discuss the film. $7,500 and anything over gets our eternal gratitude. We list you at the front of the film with a special thanks as an “Angel”. Plus you receive all the stuff above. Hardly worth it but we need you! If we can provide us with the help we need to get this film widely seen, it will point out the dangers of letting high powered Super PAC’s and billionaires control the legacy of America. If we are going to be a government of the people then we have to keep the people involved. It is no longer an option to not vote, no matter what side you are on. We all know that the people do indeed know what is best – it is only when very few of us cast an informed vote that we all suffer the consequences. The Challenge is to get the picture seen by as many people as possible. Not only Democrats and Independents, but Republicans also. This is a precarious time in our history and it is up to both sides to join together and elect the best candidates possible — not only to the Presidency, but to every office in the land. The Risk lies in doing nothing to help alter our current political landscape. Vote. Get your friends to vote. Get people to watch this film. Don’t let people bully you into voting against what you believe – not even us! We can only save America if we get everybody to chip in — to do it together. We don’t all have to vote for the same party, but just get enough sane people out to the polls and America can take care of itself.